Less Couch Potato-ing. – Studies have shown that when we watch TV our brains exhibit Alpha waves, which are associated with relaxation, sleep or light hypnosis. While rest is good, brains are a muscle that need exercise just like the rest of our body. With cable TV streaming into your house, it is easy to get sucked into watching one show after another and “veg out” on the couch for hours. Without TV you are more likely to use your time in physically or mentally active and productive pursuits. When the TV is off in our house, we start reading and the kids run around and play. Even with Netflix (which we currently have), shows come to an end and you have to actively select another show which breaks the trance and often leads us to other activities. Less Garbage – When you watch broadcast TV service you tend to consume what is thrown at you. And lets face it – with the exception of a few channels, most of it is mindless stuff. Escaping from life is great, but probably not something you want to do with the majority of your time. By the same token we probably don’t want mindless slush dominating our life and thoughts. This is especially true considering that when our brain is in an Alpha state we are highly open to suggestion so we can easily be influenced by TV more than we think. And I am not even talking about commercials. Advertisers know this about the brain and are experts at exploiting our emotions by planting desires in our heads. Less Buying – One of the most surprising things that happened for us after we nuked cable was at Christmas time. After watching tons of commercials our kids would normally ask for a mountain of gifts at Christmas time. This year they only asked for one thing each! 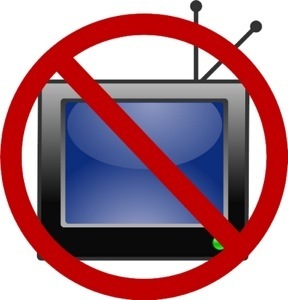 Less Noise – When the TV goes on it tends to stay on even when people drift off into other activities which makes the TV background noise throughout the house. Without cable service the TV is on less and the house is quieter. Even if you watch DVD’s or Netflix, the TV goes silent when shows end unless someone actively picks the next show. Less cable TV equals more living. We are so glad we got rid of our cable. Hey Didier! Hope you are well. Right on. I’m a huge Zappa fan and love the RHCP. I was thinking of the slime when I wrote this.